ABOUT - ABOUT - Russian chor "Weisse Nächte"
The first Russian Choir in Zurich "White Nights" was founded by a small group of people living in Zurich who like Russian music. The first meeting to discuss organizational issues was held on July 4, 2003. Soon thereafter, on August 2, 2003, our first practice took place in the premises of ARINA KOWNER Kultur-Atelier temporarily offered by Ms. Arina Kowner. 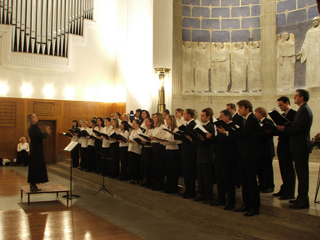 The first concert of the choir took place on June 19, 2004 within the frame of the annual cultural evening "Salon St. Petersburg - white nights of poetry and music" organized by ARINA KOWNER Kultur-Atelier. The choir celebrated its first birthday giving this first concert. At this event it was decided to call the choir "White Nights", like the summer nights of St. Peterburg that never get dark. All interested persons are welcome! Handy location in the center of Zurich. We are open to everyone regardless of age, gender or nationality. Classes are held according to a flexible schedule, every Monday and/or Thursday, 19.00-21.00. Page generated in 0.068215 seconds.